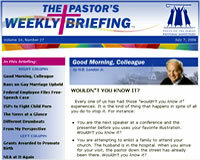 Created to keep busy pastors up-to-date on the latest issues affecting the family, this weekly newsletter contains current event summaries for use in church bulletins, sermons, newsletters and discussions. It also includes brotherly encouragement from H.B. London, challenging commentaries by several experts, suggested resources and a variety of informative features to assist you in being the cultural leader God expects. If you are interested in receiving this newsletter free by e-mail each Thursday evening, please sign up now using our own online subcription form or the Focus on the Family e-newsletter management page. If you would prefer to retrieve PWB yourself from our Web site each week rather than have it sent to you by e-mail, you can do so by selecting the desired issue below. Thank you for supporting this product. We hope you will continue to join us each week in one of the above ways. For more information, visit our E-Newsletter FAQ page. To change the e-mail address at which you already receive The Pastor's Weekly Briefing, or to unsubscribe from this newsletter, please use our special subscription update form or the Focus on the Family e-newsletter management page.